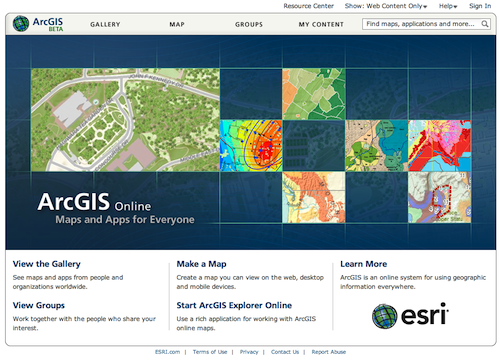 Over the weekend ESRI pushed out a public release of the ArcGIS.com website (still in beta). They’ve brought along the data from ArcGIS Online (what there was) and have wrapped it around an absolutely beautiful website. It is a little light on content, but I’m sure at ArcGIS 10, ESRI expects all of us to start sharing our data as Layer Packages on ArcGIS.com. The Gallery page is fairly well laid out, but I’m not sure if it will scale when the billions of ESRI users start integrating this into their workflows. You’ve got 3 basic sections of the Gallery; Maps, Web Apps and Mobile Apps. When you mouse over a map in the Maps section, you get an overview of the map and some very basic metadata on it. Pages appear at the bottom and while this works very well for the 2 pages that exist now, I’m sure it will get messy very quickly. But don’t worry, ESRI has a search! “Gulf Oil” results in a ton of results across the whole ArcGIS.com. The search works well as long as there is never an oil spill in another gulf. There is no way I can see to say I only want results in the Gulf of Mexico and not the Persian Gulf. It’s the typical Google (though with pretty screenshots) search method that I’m just not sure works very well with spatial data. 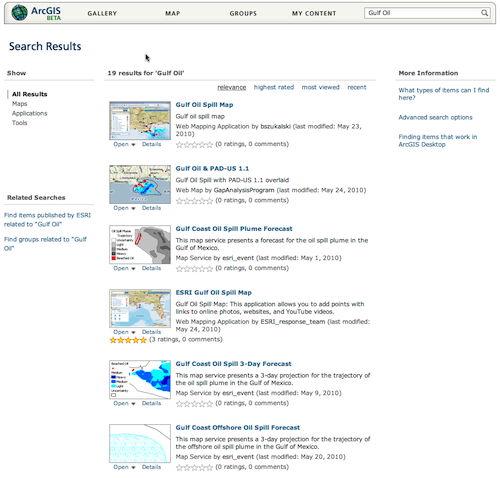 All these maps on ESRI’s ArcGIS.com have extents, why not use that for a search? Some of these you’ve seen for years, others are now. You can either roll your own on your own servers, or create a map on ArcGIS.com (which I’ll get into soon). Again, its got the same issues as the Maps section. Will it scale when the method of discovery doesn’t lend itself to maps? We’ll see. Lastly is the Mobile Apps section which is essentially the same as the Web Apps, but with only Mobile Apps. 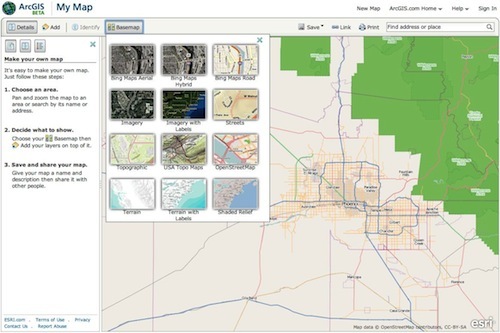 It will be interesting to see if ESRI will allow Web and Mobile Apps that use ESRI Web Services or ArcGIS Server, but not their visualization APIs (for example using OpenLayers) into ArcGIS.com. The groups section is where groups (get it?) can collaborate on their maps together. I’ve not set up a group yet, but browsing through the public ones I can see lots of them called “test”. As I’ve stated before above, you can see how the navigation becomes unusable after a couple pages have been added. No one in their right mind will browse these maps via this interface making discovery very difficult. Long tail need not apply at ArcGIS.com. Yikes, 90 pages. Time to futz with the search engine. So what do I think? ArcGIS.com is a very good start. It really looks and feels modern. Runs snappy and is quite intuitive. My problems with it are few, but to me their are just killers. No support for any open standards. 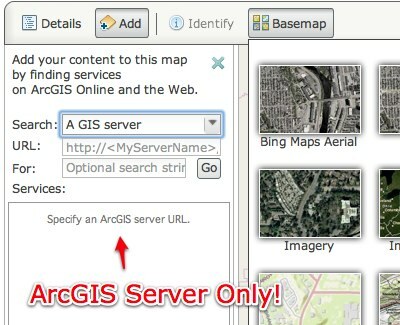 As long as you use ArcGIS Server Services and Layer Packages, you can share. 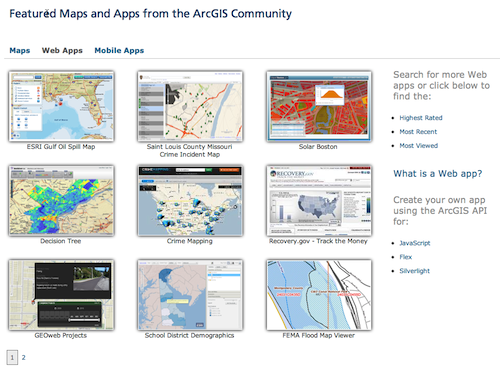 If you don’t have ArcGIS then this just isn’t going to be the place for you. Even if you use ArcGIS Server and only share WMS services, you can’t partake in ESRI’s ArcGIS.com. The other issue I have with it is that I don’t think the interface scales well. If we are all going to be resorting to using search to find anything, it makes it very difficult to just discover things. A perfect example is how I see people using Google Earth with the Wikipedia layer on. They just navigate the globe discovering content on a map. Lastly I have one huge plea to ESRI. **PLEASE ADD AN UPTIME INDICATOR TO WEB AND MOBILE APPS! **We can’t use any of these services if we don’t know how often they are down. Star ratings are useless so feel free to drop that right now and do something like FGDC does. Reliability lends credibility and I can’t imagine ESRI spending all this money on ArcGIS.com only to see it fail like GeographyNetwork. 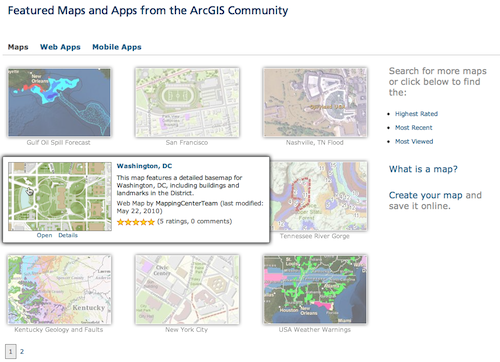 That said, ArcGIS.com is a good start and could become the premier method of visualizing geo-content on the web. I’m not sure the sharing aspect will gain much traction since it doesn’t support open standards, but ArcGIS.com Maps will be well used by just about everyone.